I'd rather have a garden full of flowers than a jewelry box full of jewels. Give me gold, and I'm likely to sell it to buy more plants. 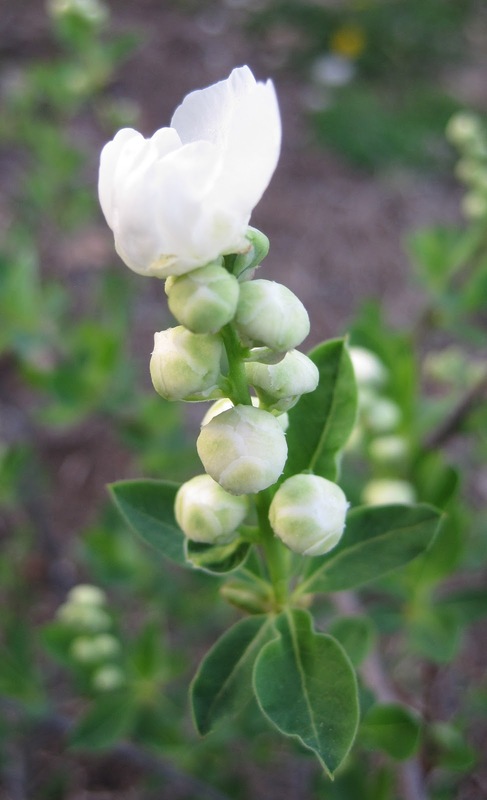 The first blooms of Pearlbush, Exochorda x macrantha 'The Bride', opened earlier this week. New to my garden, this small shrub, endured a long, hot summer trapped in a black plastic pot on my patio two years ago. I planted it in the garden that fall, then unceremoniously dug it up and moved it to another spot in the garden early the next spring. There it suffered through yet another hot, dry summer last year with very little watering. This spring, the Pearlbush shrub looks a little rough, but it is blooming. The common name Pearlbush comes from the shape of the tight flower buds, which look like pearls. I'm not surprised to read on the tag that this plant thrives on neglect. I have showered it with neglect for the past two years and it is doing well. I am good at showering neglect on the plants in my garden. I have that gardening technique mastered, having learned that more plants survive with less care than with more care. I've also learned that you really do want plants that flourish with a bit of neglect, instead of those that barely hang on with lavish care. You'll be a happier gardener when you learn this, too. 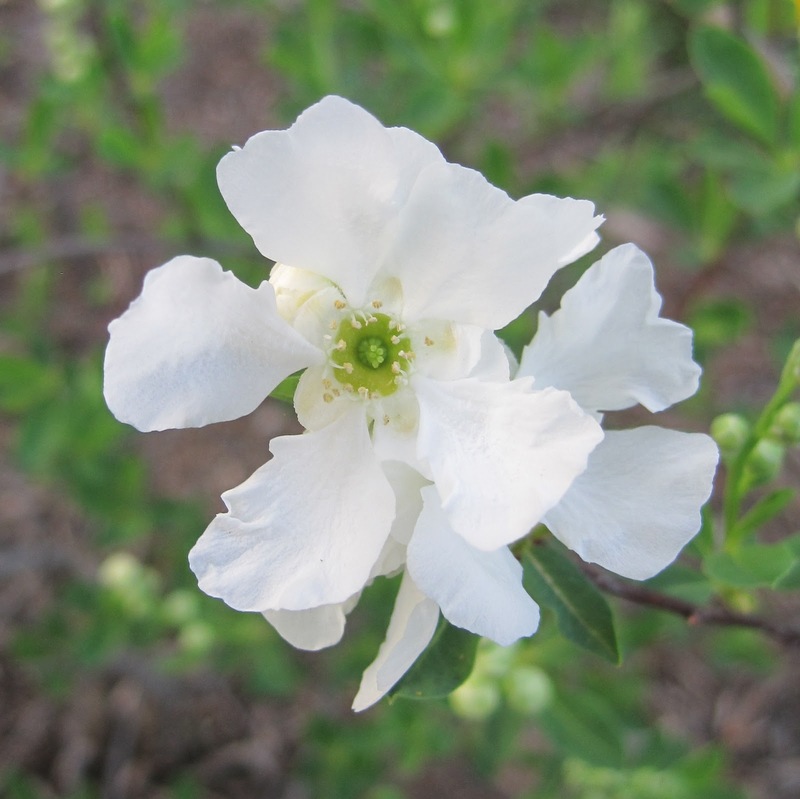 Pearlbush looks like a keeper, a great addition to my jewelry box of flowers. The buds do look like pearls! Thanks for introducing a new plant to me as I've never heard of Pearlbush. A plant after my heart! I am not familiar with this one but it sounds like it needs a place in my garden. Love the white blooms. What a lovely bride! And a pearl of great worth! I would give an eye tooth for such lovely spring flowers. I am a master of the gardening technique, neglect, too. But it sounds to me like you gave away another gardening secret without introducing it properly. I first saw Pearlbush at Hitch Lyman's garden. There is a mature pearlbush visible in the first photo in that post, on the left. I believe there is a matching one on the right, but it is harder to see. I don't remember if his are 'The Bride' or not. New to me as well, but I'll watch for this one. I like neglect-forgiving plants. It is always good to hear about those plants or bushes that can take some rough treatment. It does have lovely blooms Carol. Have a terrific weekend. Now that is a plant I haven't heard of yet! Such beautiful buds. I've never heard of this plant before. It's so lovely! I'm so glad to hear it thrives on neglect! I dug mine up from a spot where they'll quickly be overrun and moved two little plants to much better spots in my garden. I am sure it will be a great addition to our garden.